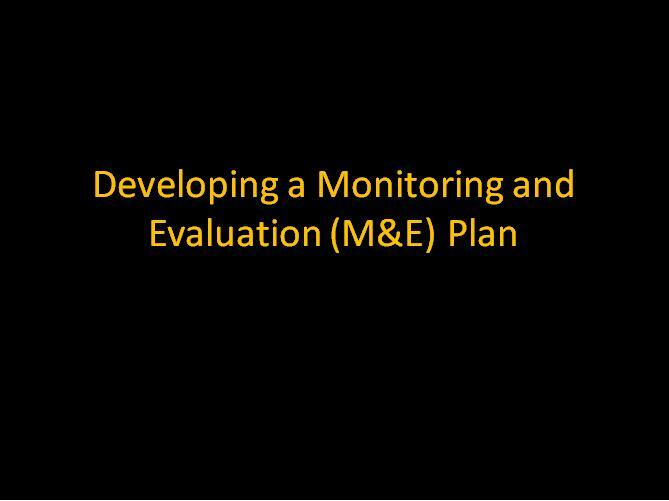 A Monitoring and Evaluation (M&E) Plan is a guide as to what you should evaluate, what information you need, and who you are evaluating for. The plan outlines the key evaluation questions and the detailed monitoring questions that help answer the evaluation questions. This allows you to identify the information you need to collect, and how you can collect it. Depending on the detail of the M&E plan, you can identify the people responsible for different tasks, as well as timelines. The plan should be able to be picked up by anyone involved in the project at anytime and be clear as to what is happening in terms of monitoring and evaluation. It is also important to remember that there are many types of evaluation. An evaluation plan should ideally be done at the planning stage of a project, before you commence implementation. This will allow you to plan ahead of time and data collection activities that you may need to undertake, such as pre-intervention surveys. However, it is never too late to develop an M&E plan. Retro-fitting an M&E plan to an existing project may just mean that you may be constrained in some of the data that you can collect. Identify who the evaluation audience or stakeholders are. The evaluation audience include the people or organisations that require an evaluation to be conducted. There may be multiple audiences, each with their own requirements. Typically, this includes the funding agency, and may also include partner organisations, the Council (or Councillors), the project team, and the project’s participants or target group. Remember that evaluation is generally undertaken for accountability, or learning, and preferably both together. If you have limited funds for evaluation, you may have to prioritise your evaluation by identifying who are the most important people to report to. Evaluation questions should be developed up-front, and in collaboration with the primary audience(s) and other stakeholders who you intend to report to. Evaluation questions go beyond measurements to ask the higher order questions such as whether the intervention is worth it, or could if have been achieved in another way (see examples below). Overall, evaluation questions should lead to further action such as project improvement, project mainstreaming, or project redesign. You should also identify at this stage whether the evaluation audience has specific timelines by which it requires an evaluation report. This will be a major factor in deciding what you can and cannot collect. When framing your outcome-focussed evaluation questions, keep them open-ended. Eg. "To what extent did..."
To what extent did the project meet the overall needs? Was there any significant change and to what extent was it attributable to the project? How valuable are the outcomes to the organisation, other stakeholders, and participants? What worked and what did not? Was the project cost effective? Was there another alternative that may have represented a better investment? Can the project be scaled up? Can the project be replicated elsewhere? Is the change self-sustaining or does it require continued intervention? Does the project have a theory of change? Is the theory of change reflected in the program logic? How can the program logic inform the research questions? Another way of classifying broad evaluation questions is presented below. Does the workshop topic and contents meet the information needs of the target group? To what extent is the intervention goal in line with the needs and priorities of the community? Did the engagement method used in this project lead to similar numbers of participants as previous or other programs at a comparable or lesser cost? Have the more expensive engagement approaches led to better results than the less expensive engagement approaches? To what extent did the workshops lead to increased community support for action to tackle climate change? To what extent was did the engagement method encourage the target group to take part in the project? To what extent has the project led to more sustainable behaviours in the target group? Were there any other unintended positive or negative outcomes from the project? To what extent has the project led to the long-term behaviour change? In order to answer evaluation questions, monitoring questions must be developed that will inform what data will be collected through the monitoring process. Monitoring questions are quite specific in what they ask, compared to evaluation questions. For example, for an evaluation question of "What worked and what did not?" you may have several specific questions such as "Did the workshops lead to increased knowledge on energy efficiency in the home?" or "Did participants install water efficient showerheads". The monitoring questions will ideally be answered through the collection of quantitative and qualitative data. It is important to not leap straight into the collection of data, without thinking about the evaluation questions. Jumping straight in may lead to collecting data that provides no useful information, which is a waste of time and money. 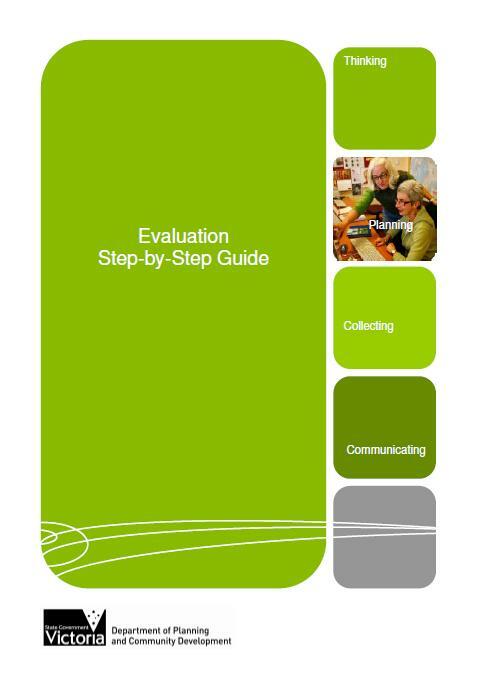 Download the M&E Plan Template to input the information or download a partically completed M&E plan template that includes sample evaluation questions, monitoring questions, indicators and sources for a kerbside recyclling education project. If you have developed a program logic, you can use this to start identifying relevant monitoring questions and indicators. Click here to see how. 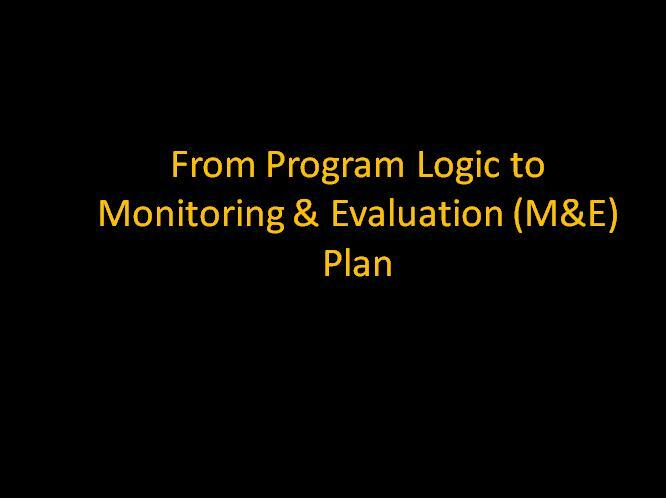 Once you have identified monitoring question in your program logic, you can transfer them into your M&E Plan Template. Click here to see how. The next step is to identify what information you need to answer your monitoring questions (indicators) and where this information will come from (data sources). It is important to consider data collection, in terms of the type of data and any types of research design. Data sources could be participant themselves, or people’s homes (eg. audit of lighting types) or metering, or even literature. You can then decide on the most appropriate method to collect the data from the data source. The evaluation tool selector is there to assist you in selecting an appropriate method for your needs. It is advisable to assign responsibility for the data collection so that everyone is clear of their roles and responsibilities. This also allows new staff to come onto the project and get a sense of who is responsible for what, and what they may have to take on and when. Collection of monitoring data may occur regularly over short intervals, or less regularly, such as half-yearly or annually. Again, assigning timelines limits the excuse of ‘not knowing’. You may also want to note any requirements that are needed to collect the data (staff, budget etc). It is advisable to have some idea of the cost associated with monitoring, as you may have great ideas to collect a lot of information, only to find out that you cannot afford it all. In such a case, you will have to either prioritise or find some money elsewhere (sorry but we have no special tool for that). This step is optional but highly recommended, as it will round off the M&E plan as a complete document. Remembering that evaluation is the subjective assessment of a project’s worth, it is important to identify who will be making this ‘subjective assessment’. In most cases, it will be the project team, but in some cases, you may involve other stakeholders including the target group or participants. You may also consider outsourcing a particular part of the evaluation to an external or independent party. For an evaluation to be used (and therefore useful) it is important to present the findings in a format that is appropriate to the audience. This may mean a short report, or a memo, or even a poster or newsletter. As such, it is recommended that you consider how you will present your evaluation from the start, so that you can tailor the way to present your findings to the presentation format (such as graphs, tables, text, images). Once you have completed your M&E plan, highlight data sources that appear frequently. For example, you may be able to develop surveys that fulfil the data collection requirements for many questions. Focus on the key evaluation questions and the evaluation audience? Capture all that you need to know in order to make a meaningful evaluation of the project? Only asks relevant monitoring questions and avoids the collection of unnecessary data? Know how data will be analysed, used and reported? Work within your budget and other resources? Identify the skills required to conduct the data collection and analysis?